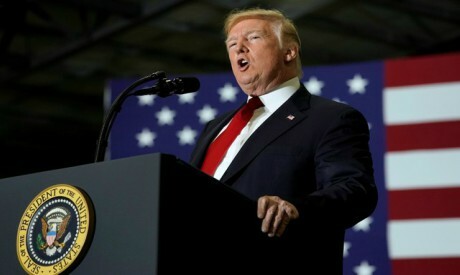 US President Donald Trump on Saturday threatened to shut down the federal government in September if Congress did not provide more funding to build a wall on the border with Mexico. "That wall has started, we have 1.6 billion (dollars)," Trump said at a campaign rally in Washington, Michigan. "We come up again on September 28th and if we don't get border security we will have no choice, we will close down the country because we need border security." A $1.3 trillion spending bill, which Trump signed last month, will keep the government funded through the end of September. A government shutdown ahead of the November mid-elections is unlikely to be supported by his fellow Republicans who are keen to keep control of the US Congress. Trump cited the hundreds of Central American migrants traveling in a "caravan" as one of the reasons for strong border security. "Watch the caravan, watch how sad and terrible it is, including for those people and the crime that they inflict on themselves and that others inflict on them," said Trump. "It's a horrible dangerous journey for them and they come up because they know once they can get here they can walk right into our country."